Twelve days after launching the latest assault on Nov. 15, forces fighting on behalf of Bashar al Assad captured approximately a third of total rebel-held territory in the northern sector, positioning them to tighten the siege. These forces have been making steady gains on that front, expanding their control to approximately three quarters of rebel-held districts and reaching the Old City by Dec. 7. Some observers have described the recent advances as the “biggest setbacks” for the rebels since 2012. Unless insurgents are somehow able to break the siege, the fall of Aleppo to Assad’s forces seems all but assured. Approximately 250,000 civilians have been trapped in rebel-held Aleppo, more than 80,000 have fled since the assault last week, according to the Syrian Observatory for Human Rights. A diverse array of local and foreign militias fighting on behalf of the Assad regime is supplanting the Syrian Arab Army (SAA), and these militias, backed by artillery and Russian air power, have played crucial roles in recent victories. Operations planning is coordinated in a joint command center (photo 1) with senior Iranian, Syrian, Russian, and Lebanese Hezbollah military personnel. Photo 1. Aleppo operations room, posted by pro-regime account in late Oct. Iranian, Syrian, Russian, and Lebanese Hezbollah flags in background. The IRGC and Iranian-backed Shiite militias have been instrumental in imposing the siege on Aleppo this past summer after a year-long offensive, and have done the heavy lifting in defeating two major Islamist-led insurgent assaults in the southwestern and western sectors of Aleppo since August, the latest of which was launched in late October and failed in early November. Pro-Assad Syrian militias and the SAA have been making steady gains in the northern sector since late summer. Also backed by heavy artillery and Russian air power, these forces have led the recent breakthrough in the northern districts. 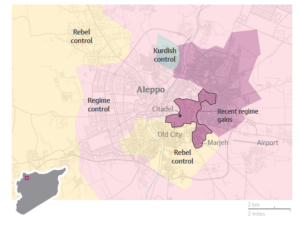 In early October, regime forces in Aleppo numbered 5,000, according to The Wall Street Journal. These figures may have included pro-Assad Syrian militias as well as SAA, as the former are frequently blanketed as regime forces in Western media. SAA and pro-Assad Syrian militias are predominantly positioned in the western, northern, eastern, and southeastern fronts directly adjacent to the city, according to pro-regime media outlets, social media accounts, and footage from press and individual accounts. The Syrian government forces include the Republican Guard, the 4th Mechanized Division, SAA special operations forces, and also reportedly the Interior Ministry’s special forces and Syrian marines. 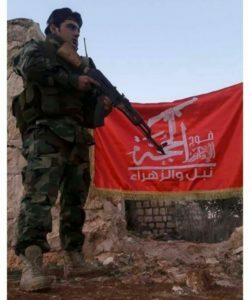 Pro-Assad Syrian militias that are participating in Aleppo’s siege include the Tiger Forces, Desert Hawks Brigade, Ba’ath Brigades, Imam al Hujja Regiment, Junud al Mahdi, Imam al Baqir Brigade, the Syrian Social Nationalist Party, and the Quds Brigade (pro-regime Palestinians who resided in Aleppo refugee camps). 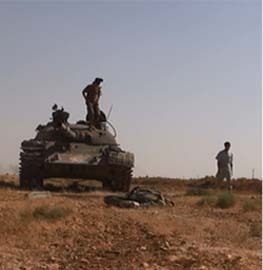 By late October, additional contingents of Desert Hawks and Tiger Forces militias arrived, according to Janes. 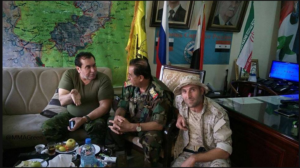 In late November, the pro-regime media outlet Al Masdar reported the arrival of 1,000 soldiers from the Social Nationalist Party and Syrian marines from Latakia. The latter’s report, however, may be inflated. The estimated number of Syrian forces and SAA could now stand between 6,000 and 10,000. Russian ANNA News, which reports from the ground, credited the Tiger Forces, led by the notorious Air Force Intelligence Directorate officer Suheil al Hassan (AKA “The Tiger”), with leading the breakthrough in Hanano district last week immediately following a coordinated assault from all fronts, forcing the insurgents to concede a third of territory. The Assad regime and the SAA, which faces serious manpower shortage, are heavily dependent on foreign and Syrian militias. These militias act independently and do not necessarily answer to the central Syrian authority – of which there is very little left. The bigger Syrian militias, such as the Tiger Forces and Desert Hawks Brigade, run their own fiefdoms with impunity, as discussed by Tobias Schneider in War on the Rocks. 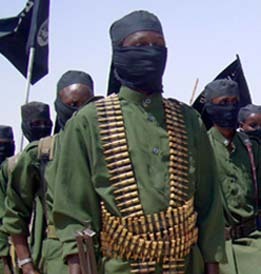 Some of these militias have developed relations with Iran and Russia. Imam al Hujja Regiment, Junud al Mahdi (Soldiers of the Mahdi), and Imam al Baqir Brigade (Shi’ified members of the Sunni Bekara clan, according to Aymen al Tamimi) are backed by Iran. The former two recruit out of the Syrian Shiites towns of Nubl and Zahra. State-affiliated Iranian media reports that 10 Syrian Shiites have been killed in Aleppo in the past month. Funeral photos (photo 2) are consistent with the flag of Imam al Hujja Regiment (photo 3), and a photo surfaced in early December of a fighter donning the militia’s patch (photo 4). The group, established in early 2016, openly displays its Hezbollah affiliation, as noted by Tamimi. Junud al Mahdi, an older militia established in the early phases of the conflict that has recruited from Nubl and Zahraa, also has some forces in the eastern Aleppo operation (Photo 5). These two groups are examples of the IRGC’s efforts to establish a Syrian Hezbollah network. Photo 2. 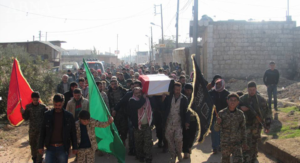 Funeral procession held in Zahraa for two Syrian Shiites killed in Aleppo operation, Dec. 7. 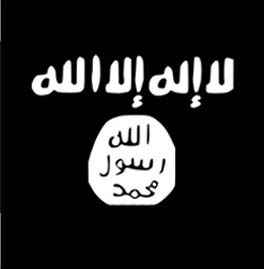 Imam al Hujja Regiment flag on left. Photo 3. Imam al Hujja Regiment of Nubl and Zahraa emblem. Photo 5. Junud al Mahdi fighters in eastern Aleppo, Nov. 4, according to social media post. While Russian sappers are clearing mines in east Aleppo, Russian military personnel have been on the ground with the SAA (photos 5 and 6), indicating advisory missions. A Russian Colonel who was advising Syrian forces was killed in Aleppo on Dec. 7, according to The Daily Beast. 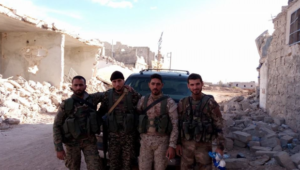 Photographs of Russian personnel with Syrian militias have increasingly surfaced in the past several months, such as the Quds Brigade, and, as highlighted by Bellingcat, other militias including Aleppo-based Ba’ath Brigades and the Imam al Baqir Brigade (which also has operational links to Iran). These indicate the Russian military’s cultivation of direct relationships with Syrian forces and militias. Photo 6. 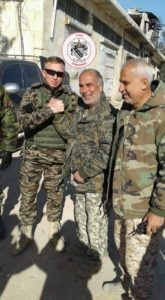 Russian officer with Syrian Republican Guard on Nov. 28, posted by pro-regime social media account. Photo 7. 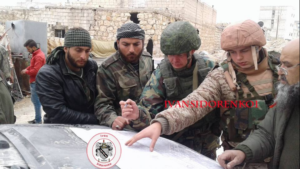 Russian military personnel with SAA Military Intelligence Shield Force, Dec. 4, posted by pro-regime social media account. The IRGC-led Shiite expeditionary forces are predominantly positioned south of the city and are holding positions on the outskirts of the city to the west and southern countryside. IRGC Qods Force operatives are active, as this branch executes Iranian strategy in Syria and has organized the Shiite militias fighting in Aleppo. Ground Forces commanders have been killed during the past month, suggesting that they continue planning operations and leading IRGC-backed militias into combat. Several Iranians below the rank of commanders have also been killed, indicating that contingents continue to deploy, though on a lower rate than the peak surge of approximately 3,000 deployed between September 2015 and May 2016, as estimated by Ali Alfoneh and Michael Eisenstadt in The Washington Institute. The bulk of ground troops in the IRGC-led expeditionary force now include Lebanese Hezbollah, the Afghan Fatemiyoun, Pakistani Zeynabiyoun, and several Iraqi contingents. According to the Russian Izvestia newspaper, which quoted a retired Syrian army general, Hezbollah boosted the total number of its forces in Syria to 5,000 and is preparing to launch an operation in Idlib after capturing Aleppo city. The figure has not been confirmed and could be inflated. However, Al Masdar, quoting a Syrian army source in Aleppo, also reported a buildup of Hezbollah and Iraqi Harakat al Nujaba in southern Aleppo countryside for a push toward Idlib. Hezbollah fatalities spiked between mid-October and mid-November as they contributed to repelling the opposition-led offensive west of the Aleppo, losing more than 40 troops, according to data compiled by Ali Alfoneh. Since that battle, Hezbollah fatalities have dropped significantly. The total number of Fatemiyoun contingent in Syria is believed to be between 3,000 and 6,000, and Zeynabiyoun between 1,000 and 2,000. Both units have also seen spikes in fatalities in the battle west of Aleppo, losing 23 and 15 between October and early November, according to Alfoneh. These fatalities continued during the siege on Aleppo: Fatemiyoun has lost 25 and Zeynabiyoun 7 since early November. These forces are fighting to wrestle control of Seikh Saeed district in south Aleppo city proper, which has changed hands several times. Photo 7. 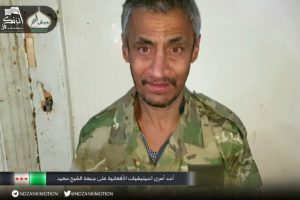 Shiite Afghan fighter taken prisoner in Sheikh Saeed, south Aleppo, by Sunni Islamist group Harakat Nour al Din al Zanki, part of the Islamist-led Jaish Fatah coalition. The Iraqi contingents include Harakat al Nujaba, Imam Ali Brigades, Asaib Ahl al Haq, Harakat al Abdal, and the Dir’ al Wilaya Brigades. These IRGC-backed units are part of the Iraqi Popular Mobilization Forces (PMF), which have recently been established as a legal, separate military institution by the Iraqi Parliament. Iraqi militias do not regularly announce fatalities publicly. The largest Iraqi group in Aleppo is Harakat al Nujaba (an offshoot of Asaib Ahl al Haq formed to fight in Syria) and has 3,000 forces of its Ammar Yasser Brigade stationed there, according to militia head Akram al Kabi. 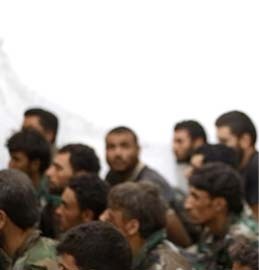 Close to Iranian leadership, the militia has operated as the largest contingent in Aleppo for more than a year. Photo 8. Harakat al Nujaba fighters in Sheikh Saeed front, posted Nov. 24. 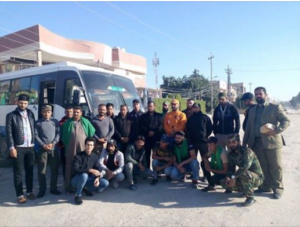 The Imam Ali Brigades, also an offshoot of Asaib Ahl al Haq, has operated in Aleppo in the past year as well, and its forces in the area have shifted in and out to other fronts, such as to Palmyra in July in advance of an assault. Harakat al Abdal is a relative smaller contingent that has operated in Aleppo province for some time, according to social media posts. It is an offshoot of the Seyyed al Shuhada Brigades – itself an offshoot of the Hezbollah Brigades, as noted by Phillip Smyth of The Washington Institute. 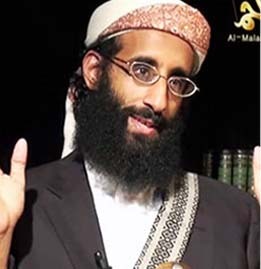 Dir’ al Wilaya Brigades is a small group that issued its first public statement in March 2015, though its affiliation could not be immediately confirmed. The militia started volunteer roll calls in Syria in September, and announced deployment of forces to Syria in early November (Photo 9). 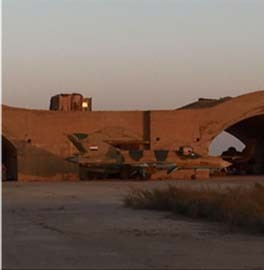 It announced training exercises were held in Hamdaniya Stadium in Aleppo prior to participating in operation (photo 10). Photo 9. Dir’ al Wilaya Brigades announcing deployment to Syria, Nov. 7, according to social media post. Photo 10. 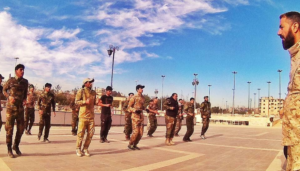 Dir’ al Wilaya Brigades holding training exercises in Hamdaniyah Stadium near Aleppo, according to social media post. Asaib Ahl al Haq has lost at least two senior commanders in Syria since September. A commander was announced killed in Syria on Nov. 29 as the battle for Aleppo was underway, according to a social media announcement, though it was not immediately confirmed whether he died in Aleppo. A senior commander who was close to IRGC Qods Force chief Qassem Soleimani was confirmed killed in Aleppo in late September. IRGC-backed Iraqi militias are expected to pour more resources into Syria as territory held by the Islamic State shrinks in northern Iraq. PMF officials have already openly announced this, and have reached an agreement with the Iraqi Prime Minister to secure the border with Syria, possibly a staging ground to push into eastern Syria. The IRGC-led Shiite militias are meanwhile planning operations in the southern Aleppo countryside to advance toward neighboring Idlib province in order to lift the siege of the Shiite towns of Fua and Kufriya. Supreme Leader Ali Khamenei has already given that order, according to Kabi, though these plans may wait until Aleppo is fully retaken. This could be the next step of the IRGC-backed expeditionary force after Aleppo’s fall. While taking the last major urban area of Syria would be a huge victory for the pro-regime coalition, few are under the illusion that it would mean the end of the war. Jihadists and rebels still control strongholds in Idlib and pockets in Hama and Damascus, not to mention the Islamic State territory in eastern Syria. Victory in Aleppo would enhance the pro-Assad coalition’s hands in potential negotiations. The city’s fall signals a new phase in the Syrian war reminiscent of a classic insurgency, in which pro-government forces hold major urban areas and insurgents control territory in the countryside. Meanwhile, as state institutions have broken down, the power structure in pro-Assad Syrian territory is that of a weak central authority that does not have a monopoly on violence and is dependent on alliances with militias and warlords who control their own fiefdoms. Tehran is content with this scenario, and can sustain its international Shiite proxy model as long as it recruits foreign fighters. The Kremlin has been openly cultivating relations with militias and the Syrian military. Both Iran and Russia have established a direct presence on the ground to project power and are cultivating relationships with militias and stakeholders in the new Syrian regime to advance their long-term interests.